Wisconsin's Bronson Koenig sunk five three-pointers en route to 27 points against Ohio State. COLUMBUS, Ohio — Playing for little more than pride in front of a home crowd and a national TV audience, Ohio State put together its most complete game of the season. The Buckeyes, out of the Big Ten race and nearing the end of a second straight underachieving season, showed a consistency that has been lacking for most of the season in an 83-73 victory over No. 16 Wisconsin on Thursday night. C.J. Jackson scored a career-high 18 points on 4-for-4 shooting from the 3-point line, JaQuan Lyle had 17 and Jae’Sean Tate added 15 points and 12 rebounds as Ohio State (16-13, 6-10) snapped a three-game losing streak and beat a ranked team for the first time in nearly a year. Bronson Koenig had 27 points for Wisconsin (22-6, 11-4), which lost the lead in the game’s first minute and could never get enough traction. The Badgers have lost three of their last four. 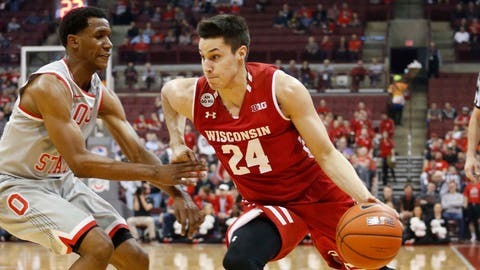 Ohio State led by 12 points with 10 minutes left on a 3 by Lyle, went up by 20 with 3:41 left and cruised to the win, beating Wisconsin for the first time in the last four tries. Ohio State seemed to have an answer every time Wisconsin picked up some momentum. “We were hitting on offense, and they just ran out of time,” Tate said. After Wisconsin’s Vitto Brown hit a 3-pointer to start the game, the Buckeyes answered with a 13-2 run and would never relinquish the lead. Five Ohio State players hit 3-pointers and they led 44-31 at halftime — despite the efforts of Koenig, who had 14 points on 4-for-7 shooting from beyond the arc. Ohio State shot 50 percent for the game, including 10 for 16 from beyond the arc, to Wisconsin’s 44 percent. The Badgers came into the game fourth in the nation in scoring defense. “It wasn’t our offense that got us in trouble tonight, it was our inability to stop them,” Gard said. Wisconsin: A stunning loss for the Badgers and a huge setback as they compete for the Big Ten regular-season crown. Ohio State: By far the biggest win in a season that has been otherwise frustrating. Ohio State outrebounded Wisconsin 38-25 and outscored the Badgers in the paint 22-18. That’s rare, as the Badgers pride themselves on scoring from in close. Coming into the game, they had outscored opponents in the paint by 282 points, good enough for a 10.5 average per game. It was only the fifth time this season that it’s happened. Tate was asked why Ohio State hadn’t been able to play like this the entire season. Ohio State coach Thad Matta said it was a matter of playing with abandon and not losing their composure after they built the big lead. Wisconsin: Plays at Michigan State on Sunday. Ohio State: Visits Penn State on Tuesday.